Charges per person are £6 per adult return, Children £4 return (6-13 years). Under 5's free. 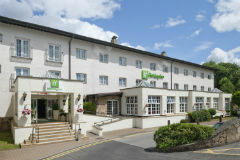 Airport Inn Manchester (formerly the Holiday Inn Manchester Airport) is located on the outskirts of Wilmslow, 2.3 miles from the airport. All rooms have en-suite bathrooms, tea and coffee making facilites, satellite TV, telephone, trouser press and hair dryer. 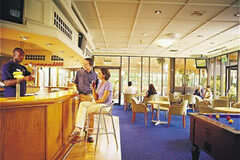 The hotel has a restaurant as well as a bar and cafe for lighter meals. 24 hour room service always available Restaurant will be closed for lunch and dinner 24th,25th,26th,31st December and 1st January. Bar snacks and room service will be available on these dates. Where dinner is included it will be a 2 course meal in the restaurant. Hotel club with pool, gym and sauna. Children sharing a room with adults must be 12 years or under. Where dinner is included it will be a 2 course meal in the restaurant. Excellent hotel, friendly helpful staff and a greAt choice of food. 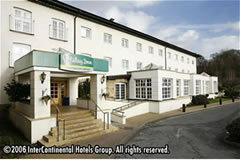 The location of this hotel is ideal and the reception staff were very helpful. In previous years the transfer to the airport has sometimes been poor, but I'm please to report that they have changed the system and everything works fine. The rooms and the common areas whilst clean are looking a little "tied", but it's great value for money. Easy to find and 10 minutes from the airport. Check in was quick and pain free. The rooms were great camp bed a little uncomfortable but slept in worse. We had to pay Â£10 to use the pool this wasnât part of the hotel but it was worth it (for 2). Sat and ate in the bar and the food was nice. Shuttle to the airport was quick and easy there and back. The hotel was clean an staff was friendly Although there's no lifts to take you to 3rd floor when you have 6 holiday cases. Having to pay for the extra facilities at the hotel (Gym, swimming pool) is abit poor. Stayed with my wife and 2 children on the night prior to our holiday with 2 weeks parking included. Good value as it was similar price to just parking at any of the airport car parks. Rooms were of a good standard and we were pleasantly surprised by the quality of the food from the bar menu. Transfers organised by hotel to airport and were prompt and professional. Would stay here again if flying out of Manchester in future. Excellent service from the staff, warm and friendly and very professional. Hotel rooms are adequately equipped and clean and tidy. Refreshments and catering facilities were excellent with full range of options available. Would highly recommend to others and we will be using the place again particularly before and after holiday travels from Manchester Airport particularly with the great offers for stay and park. Functional is the word I would use to describe this hotel. It is in desperate need of updating and decorating! Our room had a damp smell and both myself and my husband were bit in the bed ! The plug was stuck in the sink and the kids had to sleep on a sofa bed that was really shaky and a paper thin mattress ! I wouldnât stay here again .... I was attracted by the price as it was a good deal for the night stay and a week parking- however Iâd pay a little more next time for a nice start to the family holiday ! Got to hotel and dropped off car - no problems and paid for transfers to and from airport. On return we phoned to be told by taxi firm bus would be 20 mins (1-35) after 50 mins we called again and was told bus was just dropping off in airport, after another 20 mins called again, we then paid Â£15 for a different taxi to take us to Britannia. Got there at 3. Went to room and was not given key by receptionist, walked back down for key. In bed 20 mins and got 2 calls from the taxi that we phoned and cancelled wanting to know where we were. Complained to manager in the morning, waste of time, got home and found that my number plate was missing, we never stopped and we would have known if it had dropped off going home. Needless to say, we will not be using this hotel again and you should rethink your contract with Club Taxis who also left an old lady of 66 waiting for 70 mins and put the phone down on her when she complained. Hotel room was small but for one night o.k. transfers where on time just a little mix up on return transfer we were told to meet at incorrect area but the taxi driver found us so no problem. On return to hotel to pick up my car it was in right old state. Had to park under some trees/bushes. Pleased it was only a week and not two. We normally book with premier inn however after doing a price comparison we opted to give the Britania Airport inn a try as they offer onsite parking. Having read the recent reviews we where slightly anxious however given the great price we paid for 1 nights stay and 15 days parking. I think we got a bargain. Firstly, yes the rooms are tired but our room directly over the entrance was spotlessly clean which is more important than fancy furniture, after all it's just a place to lay your head. The public areas all seem fairy clean too. We had read negative reviews beforehand regarding the staff but to be honest when we arrived the lady on reception gave us a smile and a warm welcome, staff working on the bar where friendly too. Didn't try the restaurant as we walked 10 minutes down the road to a nice looking pub, food all microwaved to death though sadly. Spent most of the evening after dinner in the hotel bar which was fine. Didn't have any issues with noise again maybe lucky but slept well. We did however take a travel fan with us as we are in the midst of a heatwave. Used the airport transfers that are available to book through the hotel. Â£6 each return which again was a fair price. The morning trip to the airport went smoothly. The return trip 2 weeks later, not so. The instruction leaflet and booking form we where given is out of date. Due to drop off restrictions the cab company no longer pick up outside the jet 2 area of terminal 1. So after ringing the taxi from the location we where sent back round to the meet and greet carpark before the would accept my booking. A little annoying. The m&g carpark is now the only place everyone can go to meet their pickup both taxi and private so it's bedlam and meant a total wait of 40 minutes to get back to the hotel to pick our car up. We would definately use this hotel package again. The hotel is very close to the airport without being on top of it. Easy to find and plenty of parking. Close for a drive into Wilmslow for some dinner etc too. Check in was fine. The room was basic but perfectly acceptable for our needs. However, the coffee was vile, a upgrade here would be nice. The lift to the airport was great, right outside, totally hassle free. Friendly driver. Sadly, once I Returned the service wasnât so good. I called them to collect me,my partner and two young children and take us back to the hotel and my car but the hotel pay for number after being automatically answered left me waiting a while and when I did speak to the woman on reception she said Iâd be better off getting a private taxi and not using their shuttle, she then transferred me to a private taxi company which did not answer the phone. We had to walk around and try to find a unoccupied taxi. There wasnât any so we went back into the airport and found a company there. Was a bit of a wait but the service from that taxi company was excellent, very professional, unlike the woman who answered my call from Airport inn. Seems like she really couldnât be bothered. Family rooms consist of a double bed and a double sofa bed. Children sharing with adults should be 12 years or under. Transfers run every 35 minutes - from 03.30am and 09.20, then hourly between 10:15 and 20:15 Charges per person are £6 per adult return, Children £4 return (6-13 years). Under 5's free. Full details/procedures will be provided to guests on check in at the hotel. Any transfer information is subject to change without notice. Alternatively a set fee of £13 is agreed with a private local taxi firm. Guests need to ensure they keep their tickets issued on check in at the hotel as they do require this for their return journey. The hotel goes is non smoking. There will be a smoking areas designated outside and anyone seen to smoke inside the hotel will receive a penalty fine. Where dinner is included it will be a 2 course meal in the restaurant. Hello,I am just wondering whether car keys have to be left or if they are taken with us?Thank you for your question, you keep your own keys and cars are parked onsite left at owners own risk.